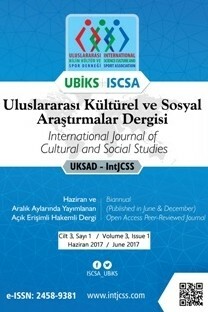 1) Journal Information: International Journal of Cultural and Social Studies is published biannually, in June and December. Apart from the ordinary issues, special issues on special topics or on conference proceedings are also planned to be published in certain periods. The journal is officially abbreviated as IntJCSS. It is an open access online journal, available as full text and open for anyone. The journal operates totally FREE OF CHARGE for both authors and readers. IntJCSS is a peer-reviewed journal, and each manuscript needs to be reviewed by at least two separate reviewers on a blind review basis. IntJCSS never asks authors to recommend reviewers for their own submissions. Those who are interested in reviewing articles should contact the manager of the journal. IntJCSS has two working languages; English and Turkish. The manuscripts written in Turkish must necessarily include an abstract in English. 2) Scope: IntJCSS is primarily focused on cultural studies, both theoretical and practical, but also is willing to explore and contribute to the field of social sciences in general. All the related social sciences, such as; sociology, psychology, history, communication, theology, management, literature, linguistics, arts, sports sciences, etc.are planned to be covered. The journal welcomes to receive submissions of reviews, original researches, case studies, letters to authors, and book/article criticisms on related topics. the journal and author(s) have the same right for the copyright of the article and either of the journal or author(s) can use it by any way without noting the other party. author (s) should clearly explain any contributions received from other parties, any financial support received either from individuals and/or institutions, and also any kinds of conflict of interest. author(s) should add an explanatory footnote to the title if the manuscript was presented in a conference or reproduced from a dissertation. 4) Originality: Submitting your manuscript to our journal, we understand that this is an original manuscript and is unpublished work and is not under consideration elsewhere. Plagiarism, including duplicate publication of the author’s own work, in whole or in part without proper citation is not tolerated by the journal. Manuscripts submitted to the journal may be checked for originality using anti-plagiarism software. 5) Open Access Policy: The journal is based on open access policy. All the articles published in this journal can be reached free of charge any time through a regular internet connection. Therefore, all our articles have free availability on the public internet, permitting any users to read, download, distribute, copy, share, print, search, on link to the full text of these articles, crawl them for indexing by any of the indexes and databases, or use them for any kinds of legal purpose without any financial, legal, or technical restrictions. For the full details of this policy please refer to Budapest Open Access Initiative. 6) Publication Fee: There is NO FEE to publish articles in this journal. We don't ask for any charges under the name of article submission or processing cost. Please remove your name and institutional information from the article when uploading. Load the article in accordance with the journal's writing rules. (1) Title: including the complete article title; each author’s full name; institution(s) with which each author is affiliated, with a city, and country; and the name, complete postal address, telephone number, and at least one email address for author(s). IT IS NECESSARY to have EACH AUTHOR's affiliation and contact, at least valid email address. Manuscript length for a research paper should be 4 to 20 pages. Authors should follow the explanations on the web site in order to submit their articles. References (APA style): Cite references in the text as “last name, year”, e.g. (Kırık, 2013: 67 ). For multiple authors and page numbers in the text, e.g. (Turkmen et al., 2013: 65). References should be listed in alphabetical order, and include all the authors’ last names and initials (no dots after initials), title, journal, year, volume, issue, and pages etc. Gardner, H., Kul, M., Taner, B., Ozkan, A. (2012). Multiple intelligences: the theory in practice. New York: Basic Books. Stanford, P. (2003). Multiple intelligence for every classroom. Journal of Education Psychology, 39(2): 81-89, http://www.makalearsivi/tarih.ornnek.html (14 Mayıs 2016 tarihinde erişim sağlanmıştır). Turkmen, M. (2004). The effects of martial arts on children development. International Journal of Contemporary Educational Studies (IntJCES), 8(1): 276-281.